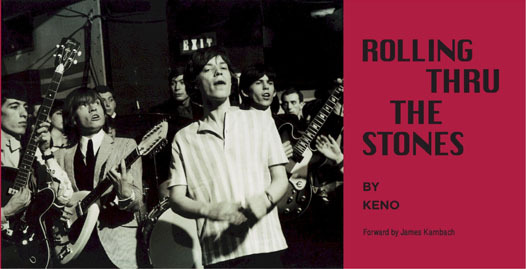 A Rolling Stones book from Keno! Read about the Glimmer Twins: Mick Jagger & Keith Richards! Then learn about the other Stones: Charlie Watts, Mick Taylor, Bill Wyman and Ronnie Wood! Over 130 Stones photos, 98 of them never published before. All this and more, all in one book! The most asked Rolling Stones questions - answered! The birth of the Land of Gas! Up Front with the Stones! Keno has uncovered the many urban legends about the Stones with the most up to date realities through his sources and contacts throughout the Stones world. I enjoyed reading this book and you will too - James Karnbach, music consultant, Rolling Stones insider and author, who wrote the books foreword. Radio interview about the book with Keno from KKFM, click: here. To order the book using your credit card (non-signed copy): Visit Atlas Books, Alibris or Buy.com , or most of the other on-line book stores. **Order today and receive a discount! Please send your name, full shipping address, along with credit card info (see below), check or money order in US funds, for only $15.95 (one book), plus the shipping costs. The rate for shipping is : within the USA: $7.00 (sent by US Priority Mail) , to Canada: $9.95 (sent by First Cass Mail), Mexico $12.95 (sent by First Cass Mail). All other locations: $15.95 (Standard International Mail). To order more than one book, or if you live outside of the US and would like your book shipped by Priority Mail, or if you have any other questions, please write Keno an email, thanks. Copyright © 2010-17 by Keno Internet and Onek Publishing. All rights reserved.